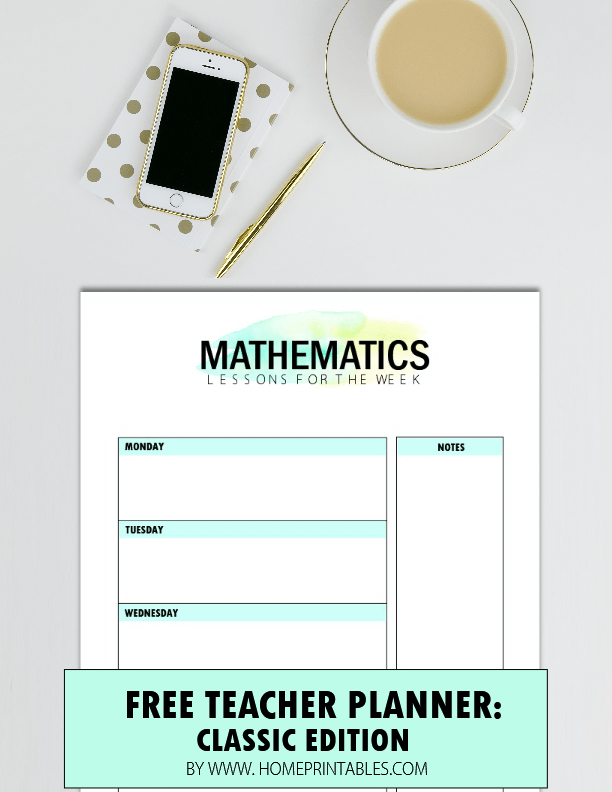 Look at what I have created for you today– an ultimate pack of free Teacher Planner printables, designed for all the outstanding educators out there! Dear Ma’am, we are simply grateful for all your hard work; and as my little way of thanking all of you, I created this classic teacher binder for you! It has over 35 sheets to help you organize your work and classroom! It is during this time of the year that many teachers like you look for printable organizers to use in the new school year. I know that so well because once upon a time (Okay, just two years ago), I was a teacher like you! Back then, when a new school year is nearing, I would spend hours scouring the net looking for available freebies to help me get organized in school. While there are a variety of options available, I wished back then to be able to find a complete and streamlined binder, in a cohesive design theme. Unfortunately, I couldn’t find any. Though I loved to, I had no time to create my own during those moments. So now that I am blessed with free time to create printable organizers, I decided to design a planner for all the teachers. 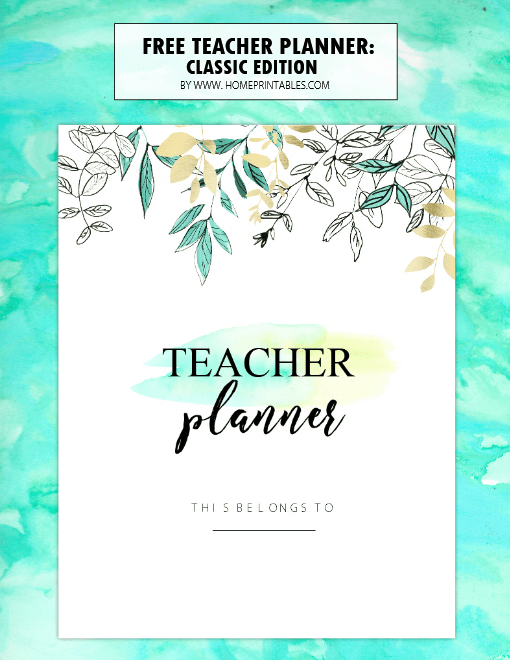 Although I have already left the classroom (I was a teacher for 8 years), I thought I’d still create some teacher planner printables for my teacher friends and readers like you. 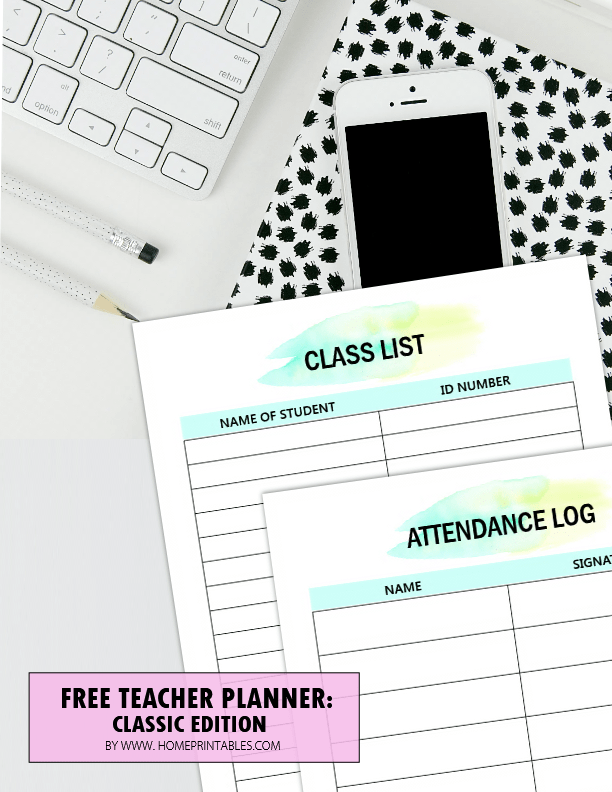 I believe a free printable teacher planner like this one would be of great help in managing classroom. Let me show you what I’ve got for you! 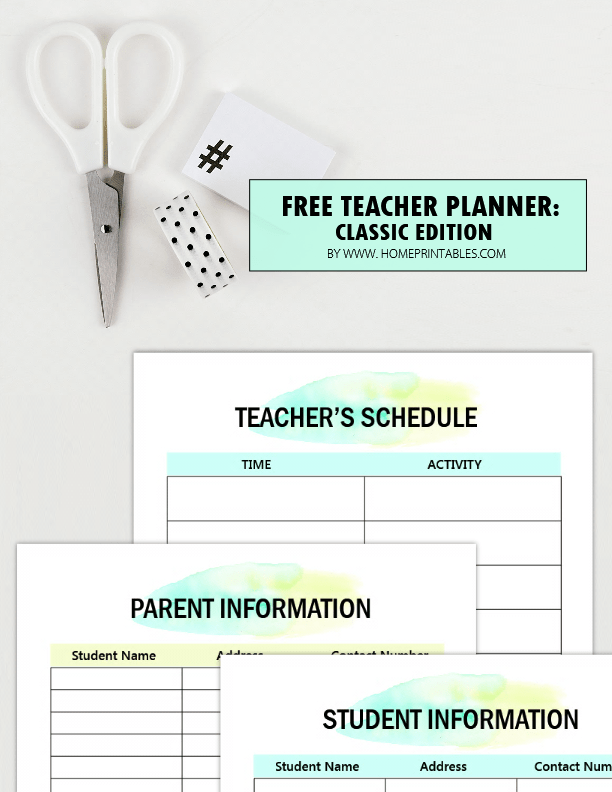 This free Classic Teacher Planner, I believe, covers all the classroom essentials– from student data sheet down to class grouping templates and lesson planners. Yeas, Teacher, I understand how difficult it is not to have a planner handy when you’re managing a class so I made sure to include all the basics. Yaaay! 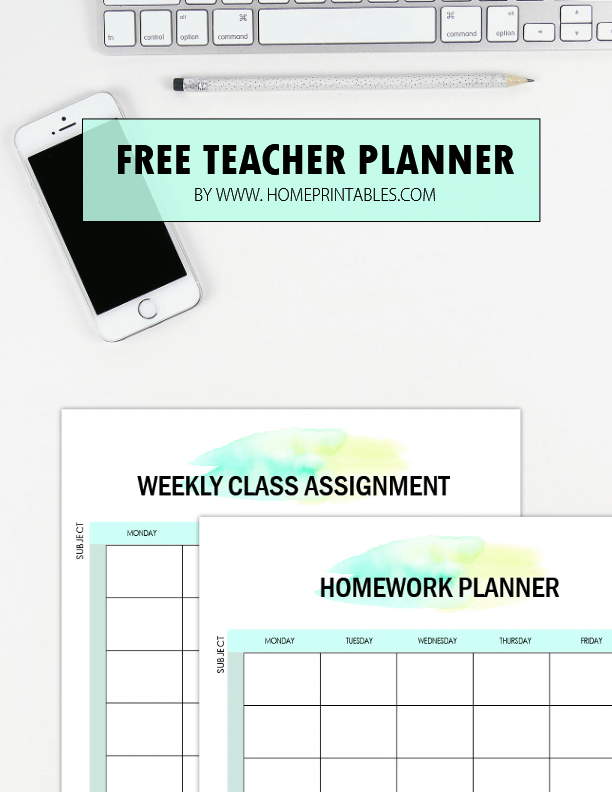 Speaking of the design, this free printable teacher planner has a minimalist look. It comes rather simple yet pretty with only a watercolor splatter as the design element for each page. The covers however come a grand with four beautiful designs to choose from. Here, have a look. Additionally, here’s a sneak preview to some of the pages included in this free teacher planner printables. I included a directory for students and parents in the teacher binder. This way, you can immediately pull out the numbers or addresses you need any time. I’ve also included pages that you can use, like your schedule sheet. Printable attendance log and class list are two basic essentials in a teacher’s binder. I also designed pages like these and included them in the teacher planner binder that I am sharing with you. 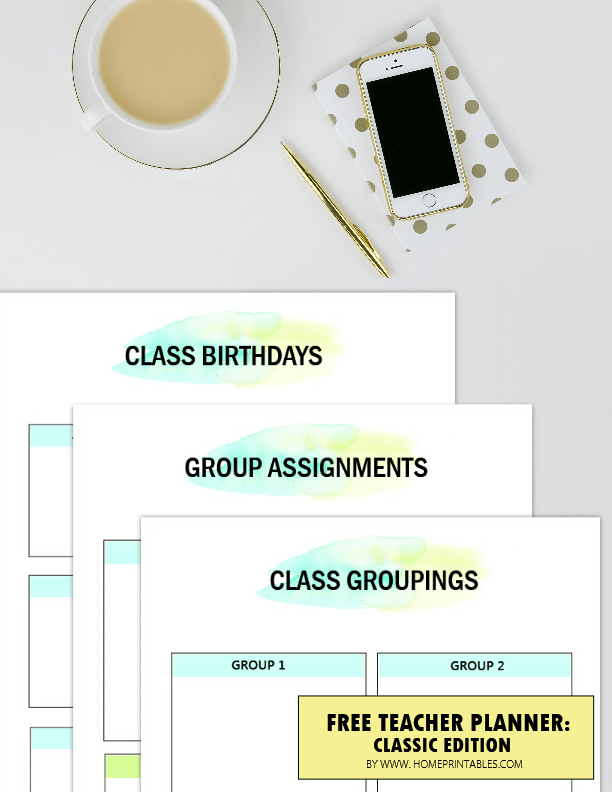 Simple organizing sheets like Class Birthdays and Class Groupings are always nice to have around, right? You’ll also get to enjoy pages like these in your free printable teacher planner! So you can plan the homework you’ll give to your students, I’ve also designed pages for your homework planning. These planners can also be printed out and shared with students! Well, these are just some of the pages you’ll find in this free teacher planner printables binder. As I have said, it has over 35 classroom organizing printables that you can use! Should you like to get your copy now, please go HERE. It’s free for personal use! Wait there’s more! While this Teacher Binder is pretty and classy in its minimalist look, should you be looking for a cute Teacher Planner (especially created for grade school teachers), hop over HERE to see what the Shining Mom blog offers. It’s a fun and cute teacher binder with plenty of planning pages for your classroom! 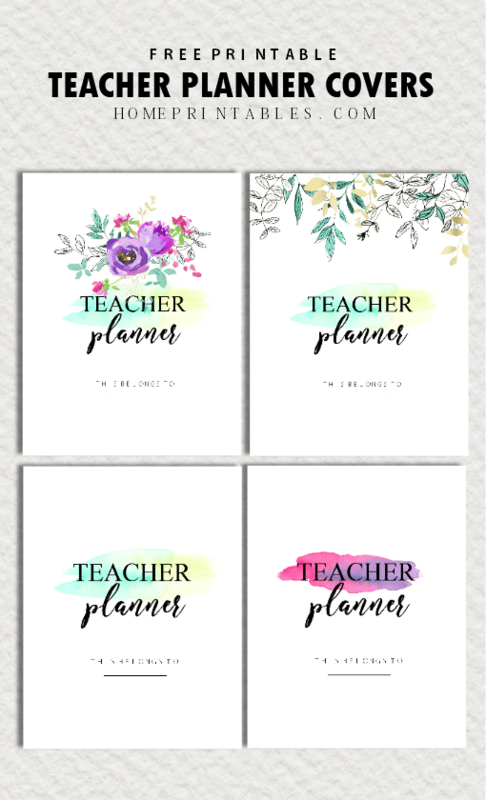 Aside from these teacher binders, we have also previously released a free Student Planner here at Home Printables blog which you can share with your students. Please find the student binder HERE. One last thing! If you’re a mom looking for a system to help you manage your home, do check out this ULTIMATE HOUSEHOLD BINDER for busy moms like you. You might love to use the 70++ pages for your organizing bliss! Update: Two new free student planners are released on the blog. It’s something you shouldn’t miss. View the printables now! Cheers to another awesome school year ahead! May this teacher planner help you organize your days! Have loads of fun and learning in your class. I hope you can help me spread the freebie by pinning my images on Pinterest. Thank you! Good luck, teachers and enjoy this pretty planner! This looks great!! Thanks so much! !